New EMS-1000 Electro-Magnetic Spinning Viscometer Solves Difficult Viscosity Testing Problems. Fairfax, VA (August 15, 2017)— The EMS-1000 Viscometer runs contact-free tests for dynamic viscosity. To run a test, a small amount of sample and an aluminum sphere are placed in a test tube and sealed. The test tube is inserted into the EMS-1000, and magnets rotate around it, causing the sphere to spin in the sample. The sphere’s motion correlates to the sample’s viscosity. During a test, the sample temperature can be varied over a wide range, and the progress of the test is recorded on a built-in camera. The small volume of sample needed alleviates the problems of testing costly materials, and where availability of materials for testing is limited. Because the materials are in a sealed tube, complications associated with viscosity testing of biohazardous and air-sensitive products are eliminated. Where avoiding contamination is paramount, clean-up issues are resolved by the disposability of the sealed test tube and aluminum sphere. 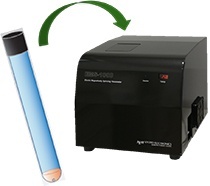 Unlike many complex testing procerdures, the EMS-1000 require only two steps: inserting the test tube and pressing the start button. Further, the combination of temperature control and video recording allow the user to program and monitor viscosity tests as never before, observing such things as curing and coagulation, and detecting impurities in real time. The EMS-1000 Viscometer provides a new scope of viscosity analysis for research and development. This instrument has applications in the biomedical, pharmaceutical, chemical, and cosmetics industries, among others. The EMS-1000 Viscometer is now available through CSC Scientific Company, Inc. and Scientific Gear, LLC. Contact Hank Levi at Scientific Gear (hlevi@scientificgear.com) or Amanda Ranowsky at CSC Scientific (aranowsky@cscscientific.com) for more information.